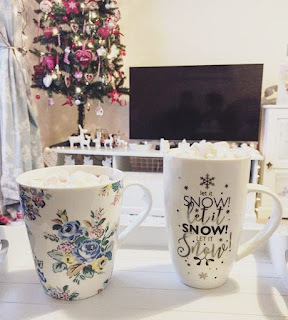 Welcome to an extra festive edition of my monthly Life in Instagram post! Check out what I got up to over the Christmas season and, of course, #WhatIgotforChristmas! I know people love being a little bit nosey (me included!) and checking out Christmas pressies, so here are mine! I was a very lucky girl this year and got so many lovely things including new hair curlers, PJ’s, smellies, Cath Kidston bits, gin, and a fancy towel bale to go in the new bathroom! I also can’t even count how many hot chocolates I’ve had over the last couple of weeks.. all topped with a healthy serving of cream and marshmallows! Before Christmas I realised that since moving into my new home in September, I hadn’t yet had a bath! So I decided to treat myself to a nice hot bubble bath using some of my Treaclemoon bath soak and lit a candle. It was so nice to soak and relax, although I think I still prefer a shower! 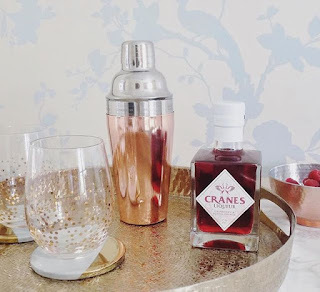 I published a blog post earlier this month on my new metallic drinks tray featuring this gorgeous gold tray and rose gold cocktail mixer. Unfortunately I didn’t get as much use out of it over Christmas as I had hoped, but there’s still New Years Eve to come! I’ve created a little desk area in my dining room using this wooden table that I used to have in my old bedroom. I did a little bit of upcycling on the table a few years ago, as when I first bought it from an antique shop it was a very dark varnished wood. I painted it white and covered it in a pretty wallpaper on the top which also matches my cabinet in the living room! 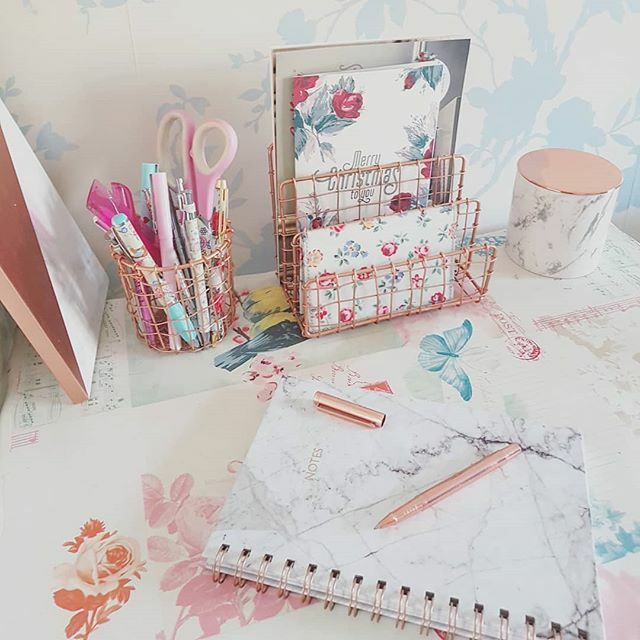 On the desk I have added a few copper accessories including this gorgeous sleek pencil cup and matching letter holder from Cabo at Red Candy. 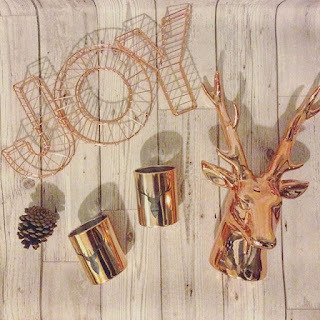 They are made from hand woven copper wire and I love the eye-catching design! I’ve put all of my favourite pens and stationery in the pencil pot and the letter rack is so useful to store all of my letters/bills etc that I don’t want to lose. I also had a hair makeover done at the new Seckingtons hair salon in Milton Keynes.. more to come on this soon! 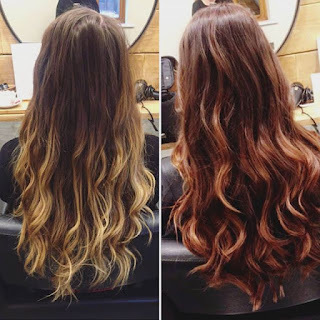 I love it so much ? Gin-gle bells! I have some new additions to my new drinks tray! These gin filled baubles from award winning The Lakes Gin Distillery make a great gift for any gin lover, and can be hung on your Christmas tree until you can no longer resist. 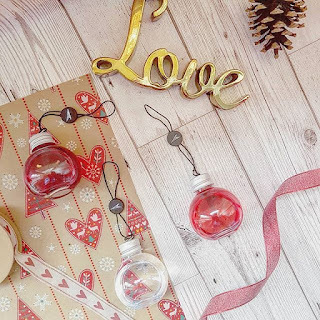 The gin Christmas bauble set includes six baubles in total, presented in a gift box. The six baubles include two of each flavour: The Lakes Gin, The Lakes Sloe Gin Liqueur, and The Lakes Damson Gin Liqueur. The Lakes Gin is a flavoursome speciality gin created in The Lake District, all from locally sourced ingredients from Cumbria. The Sloe Gin is my favourite.. I loved the festive notes cinnamon and orange citrus. 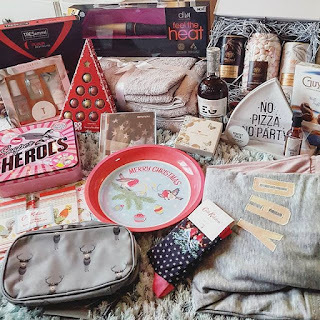 I managed to pick up a few festive bargains a few days before Christmas as Wilko started their sale early. I picked up this gorgeous copper wire JOY sign for only £2.50, the copper stag tealight holders for 50p each, and the gorgeous big rose gold stag head for only £5! 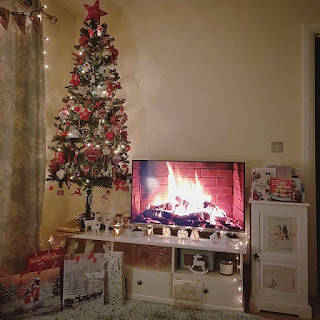 Would it be weird if I kept that out all year round?! My parents and I went on our annual trip to Olney, a small town just outside of Milton Keynes, for a little walk around. 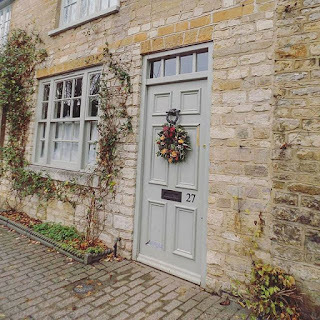 I always love visiting just before Christmas as all of the beautiful old houses have handmade Christmas wreaths on the doors. There are also lots of cute little shops and my favourite tea shop for afternoon tea. I posted last month about my lovely new bedding from The Happy Linen Co and it’s literally my favourite bedding ever! 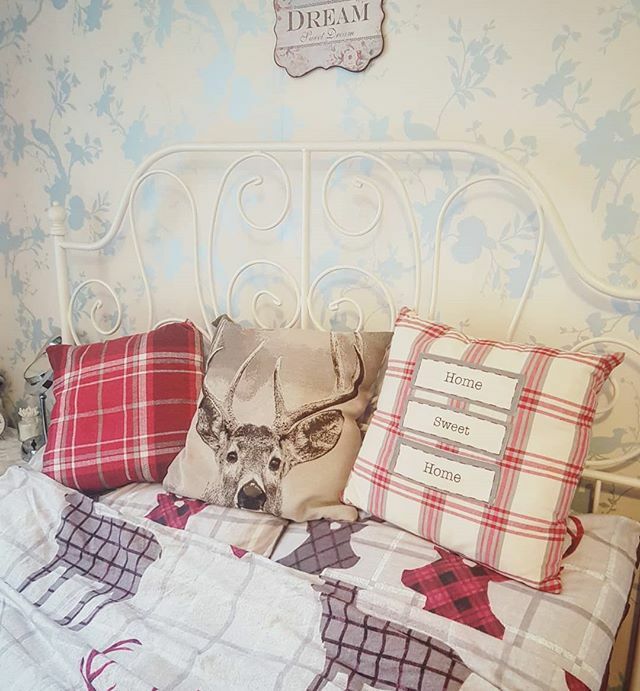 It’s kept me so warm and cosy over Christmas, I’m going to be sad to have to change it! I have loved having the Christmas tree up in the flat and spending our first Christmas together in our own home. It was a bit weird not being with my family on Christmas morning but I quite enjoyed having a chilled morning and doing whatever we wanted! 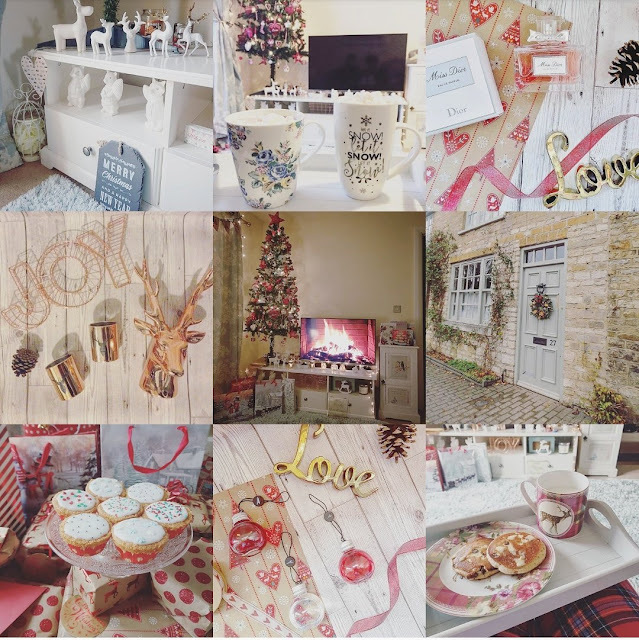 I went a bit OTT with the Christmas decorations perhaps, but I loved having everything all Christmassy! I love all the cute little decorations and the pretty fairy lights. It’s going to feel empty when it all comes down. 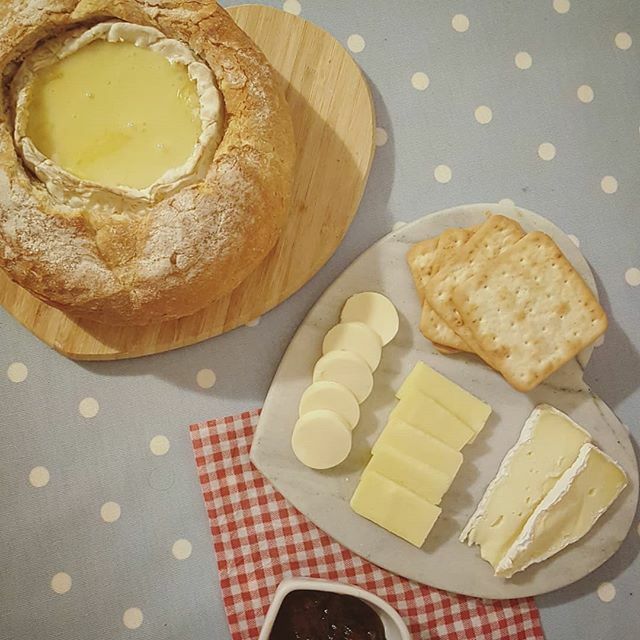 I think my favourite thing about Christmas is the food and the fact that I can scoff my face guilt free! On Christmas Eve I made a little cheese board using my new marble heart shaped board and a Camembert baked in a crusty loaf of bread (it was more effort than it was worth!). And for Christmas day breakfast I made myself lemon and raisin scotch pancakes.. my fav! 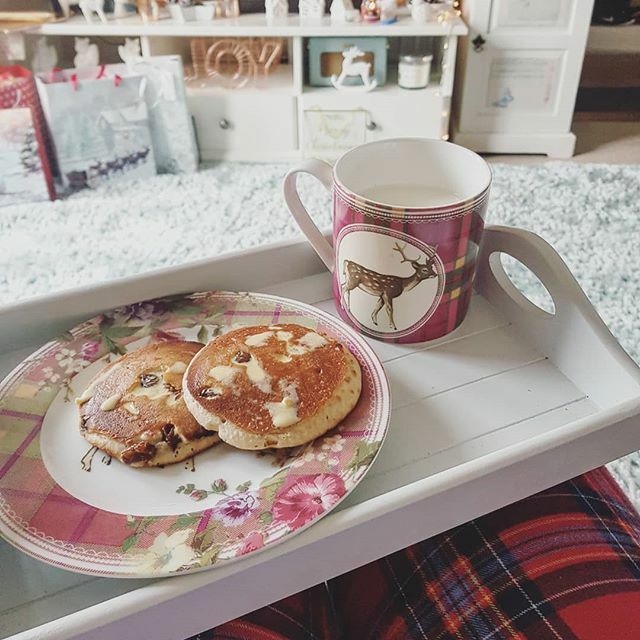 I love my new tartan crockery set from Katie Alice, I’m gutted it’s now been discontinued so I can’t buy any more. Also.. check out these snazzy GIFs I made… this took me longer than I ever expected ? 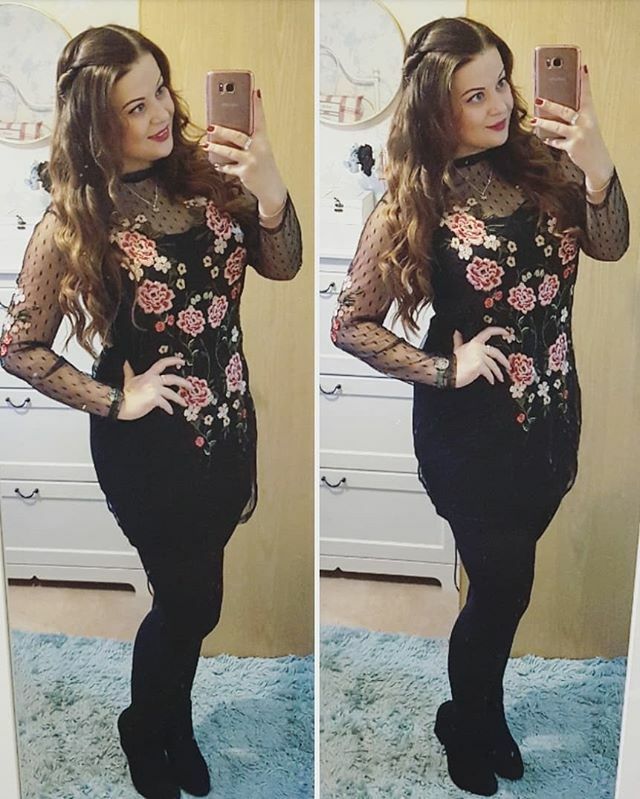 I didn’t really take any photos on Christmas Day itself, but here’s a photo of my outfit! 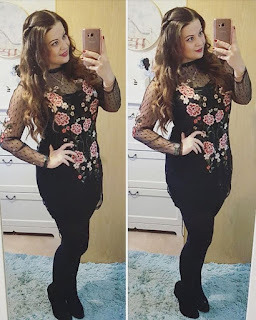 I bought this pretty embroidered mesh dress from New Look (it’s now in the sale for only £15!) and I absolutely loved wearing it. I hardly ever post selfies any more, but I felt confident in this outfit so thought I’d share it! 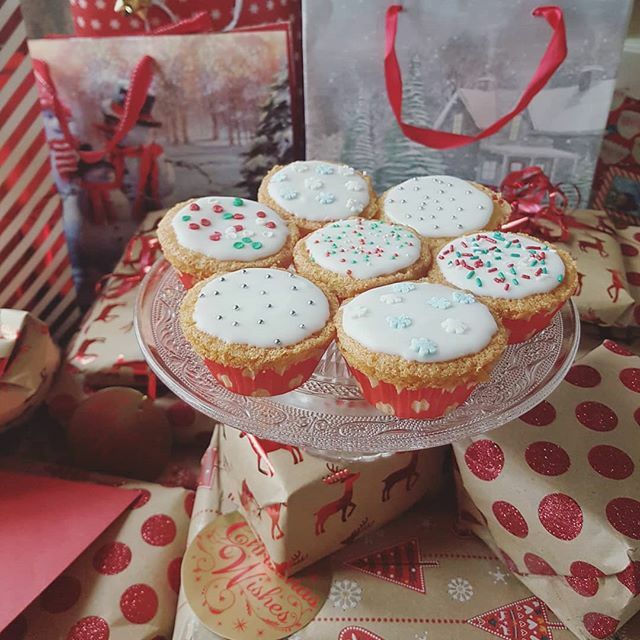 I also spent Christmas Eve baking and decorating some yummy simple fairy cakes! I actually ended up making 30 but these were the prettiest ones that made the cut for the Instagram photo! And finally.. I also got a little bit crafty and made a cute personalised frame using wooden scrabble letters. 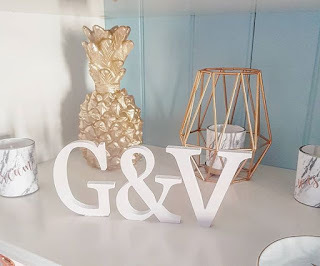 I bought the letters from Ali Express, it was about £1.80 for a big bag of them. 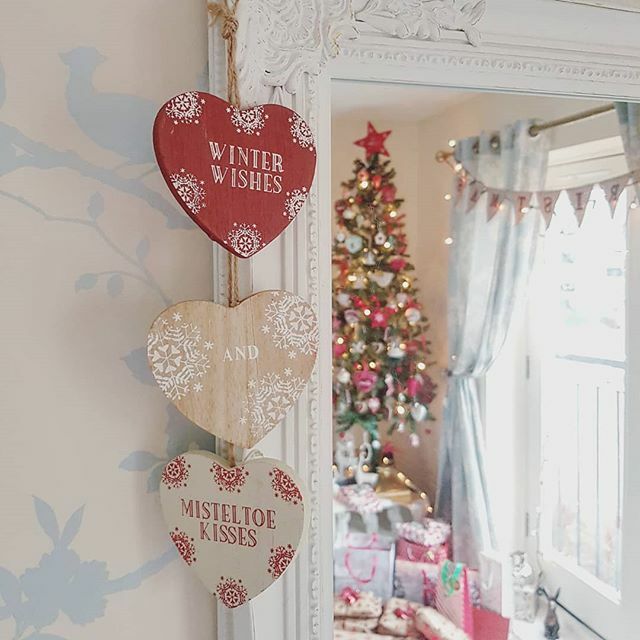 I also used some of the tiles to personalise Christmas gift tags! 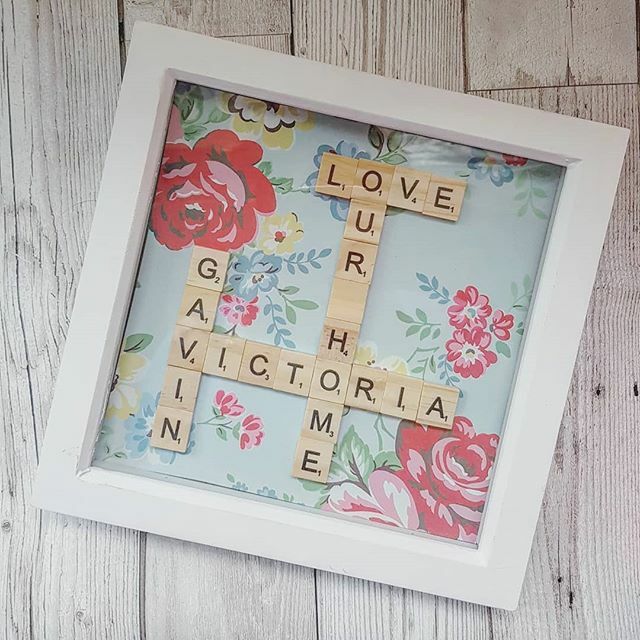 I used some Cath Kidston floral paper as the background and a box frame I picked up in a charity shop for 50p. I love how it turned out! And so simple too. I also picked up these cute little initial letters from Ali Express too, for only 50p each! They make quite a nice little feature on my shelf.. and so cheap!